Star Wars: The Last Jedi Rebel Symbol Stein - EE Exclusive:You're a Rebel - show it! This exclusive ceramic stein will let people know you're a rebelandclassy! Limited edition of only 816 hand-numbered pieces. Fans of theStar Warssaga don't want to miss this! 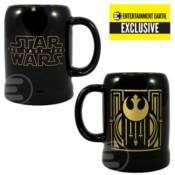 Entertainment Earth Exclusive!Kick back, sip a tasty beverage, and say a toast with your fellow rebels! Fans of theStar Warsfilms will want this sleek stein in their lineup of mugs, where it's sure to be a standout. The Star Wars: The Last Jedi Rebel Symbol 20 oz. Ceramic Stein - Entertainment Earth Exclusive sports an elegant art deco design, with a black body and gold embelishments. It holds 20 ounces and displays the iconic Rebel symbol on one side with theStar Warslogo on the other. A limited edition of only 816 hand-numbered pieces, it's perfect for that Rebel within you! Hand wash only. Not dishwasher safe. Do not microwave. Ages 13 and up. We reserve the right to limit quantities ordered.